‘Is it not strange, this madness that has gripped us?’ asks Cornelius. ‘What madness?’ asks the painter. ‘This speculation on tulip bulbs! Great fortunes have been made and lost. These new hybrids that they have been growing – they fetch the most astonishing prices. Thousands of florins, if you know when to buy and sell..’ Cornelius’s voice rises with excitement; he too has greatly profited from this tulipomania. This extract sums up the emotions and financial risks that 17th century Dutch merchants were subject to when the desire for this simple flower overtook the world. 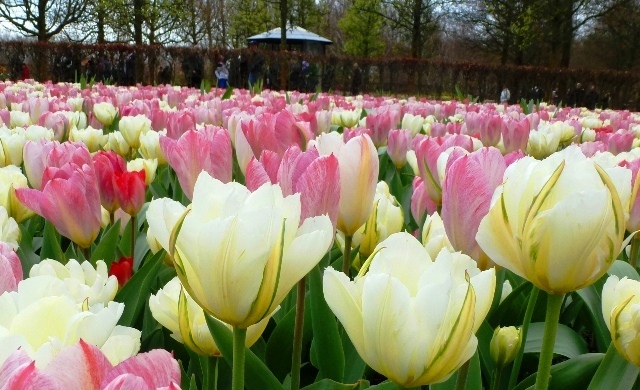 On a visit to the Keukenhof Gardens in Holland you get an idea of why the beauty and variety of tulips enraptured so many. Mondrian-like blocks of colour flashed by the window as I travelled to Keukenhof by coach from Amsterdam. We were passing the famous Dutch bulb fields. On arrival, the luscious scent of hyacinths hits you as you queue to get in – it’s a place of sensory pleasure even on a chilly spring day. Keukenhof means ‘Kitchen Garden’; in the 15th century, herbs were grown here for aristocratic Countess Jacoba van Beieren’s Castle. Every autumn seven million spring flower bulbs are planted – not just tulips but crocuses, daffodils, narcissi, hyacinths and lilies. Covering more than 30 hectares with 15 kilometers of footpaths you need some good walking shoes and plenty of stamina to take in all the attractions. 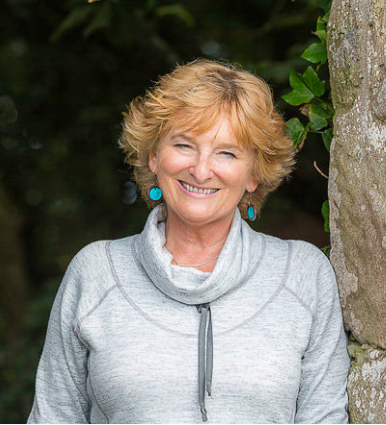 In the Historical Garden you get a feel for the history of the place with its grey stone walls showcasing older varieties of plants as well as herbs and flowering trees. Stroll down Beech Lane, designed around 1850; on either side the flower beds flow in scented grace, tempting the visitor to pause for a moment to take in their natural beauty. 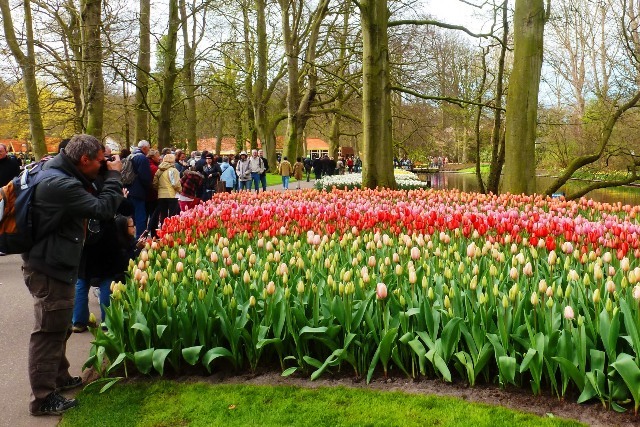 Modern day tulip fever takes over as people jostle to get the perfect photo. It’s a photographer’s dream – impossible not to be seduced by the colour, artistry and sheer exhuberance of this spring tapestry. 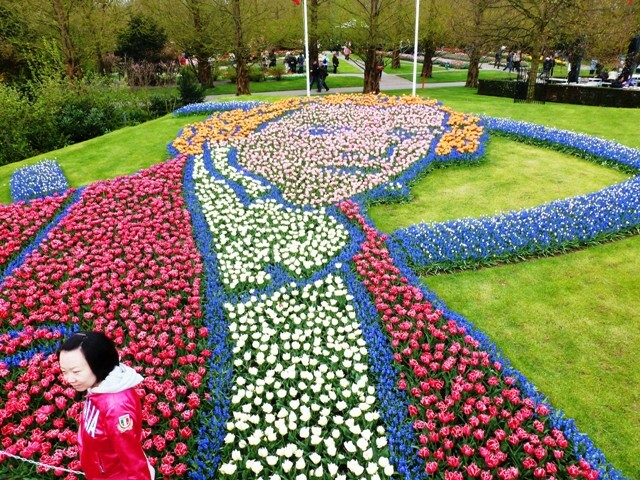 Each year Keukenhof chooses a different country as the central theme for the park. 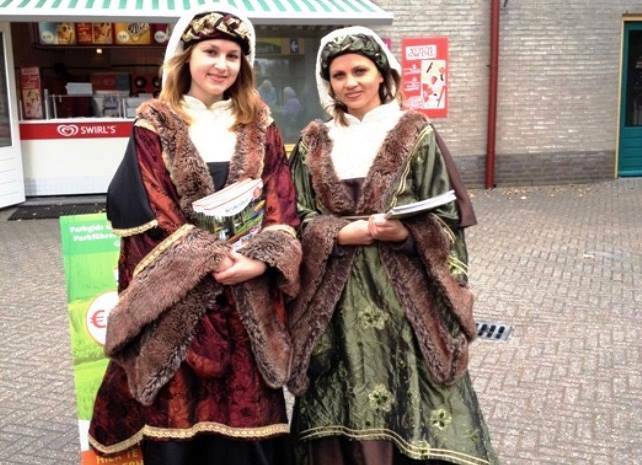 When I went (2012) it was ‘Poland – Heart of Europe’ This was particularly significant as it’s an increasing market for Dutch flower bulbs and many Polish tourists now visit Holland. The show highlighted key figures such as the astronomer Copernicus, scientists Marie Curie and Fahrenheit, Pope John Paul II and the composer Frédéric Chopin. One of the most popular displays was the floral mosaic of this brilliant pianist. 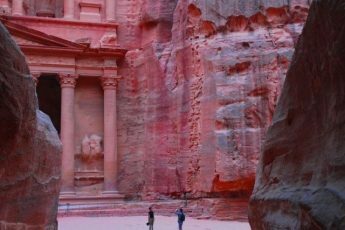 As well as the meticulously laid-out gardens there are 5 large pavilions hosting flower shows of azaleas, lilies, orchids, anthuriums, bromelliads and many other exotic plants. The Willlem-Alexander Pavilion is the largest, housing magnificent daffodil and tulip displays and before the Gardens close, a grand finale – the world’s largest Lily Show. 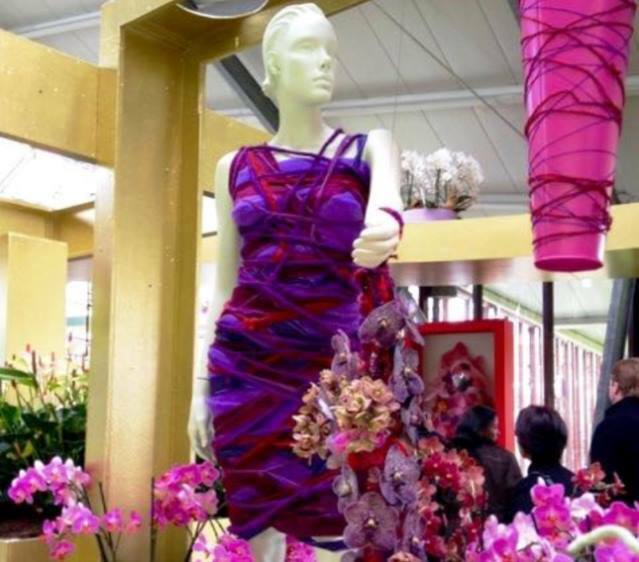 There are whackily creative displays of the florist’s craft in the Oranje Nassau Pavilion which change every two weeks. They also reflect the annual theme, so musical notes hung from the ceiling to celebrate Mozart and Copernicus was remembered with starry baubles. Used to the more conservative atmsosphere of British Flower Shows, I loved the exhibition in the Beatrix Pavilion where haughty models bedecked with all manner of vibrant flowery garments posed with insouciant charm. In a corner of the grounds is a huge wooden Windmill, given to the park in 1957. From the top you can take photos of the surrounding bulb fields and you get a great view of Mill Square and the gardens. When I was there, a lively brass band was delighting the audience with their musical antics. It was so different from our somewhat reverential brass bands seen in public parks around the country, usually watched by old folk falling to sleep in fading deck-chairs. 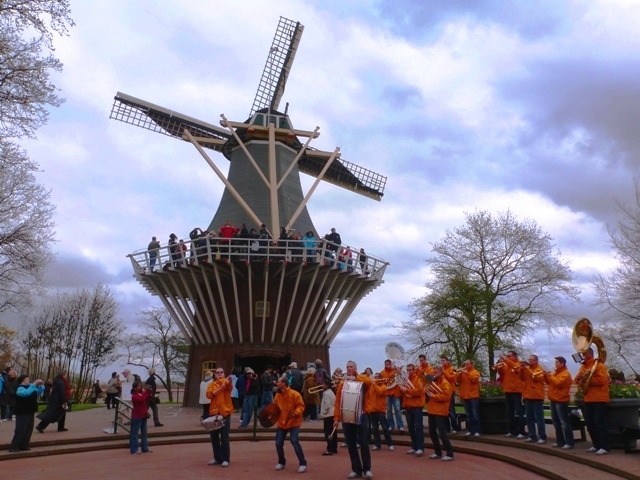 In their patriotic bright orange jackets and mischievous smiles, these musicians encouraged the audience to dance and young tourists dared each other to have their photos taken with this crazy gang of Dutch fun. Dotted around are unusual and thought-provoking sculptures. 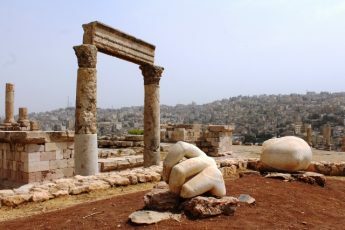 Artists are given the opportunity to exhibit their work to an international audience and their locations are carefully thought out. The Zocher Garden in the centre of the park has a tranquil lake with elegant swans, a trefoil fountain and huge stepping stones. Much to everyone’s delight there were a group of ‘swimmers’ bobbing up beside the huge stepping stones – a very quirky sight! 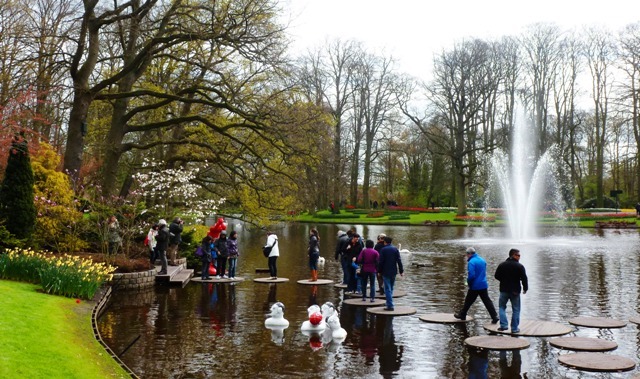 There are plenty of places to eat and refresh yourself in the Keukenhof Gardens – search out the delicious Dutch waffles with syrup. 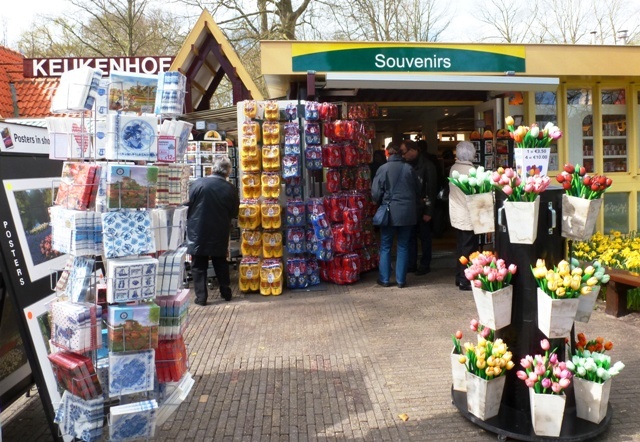 Should you wish to indulge in your own tulip fever, souvenir shops are available, selling everything from tulip bedecked ties, bulbs of every imaginable hue and scent, table napkins and the wooden flowers if you’ve not got green fingers. 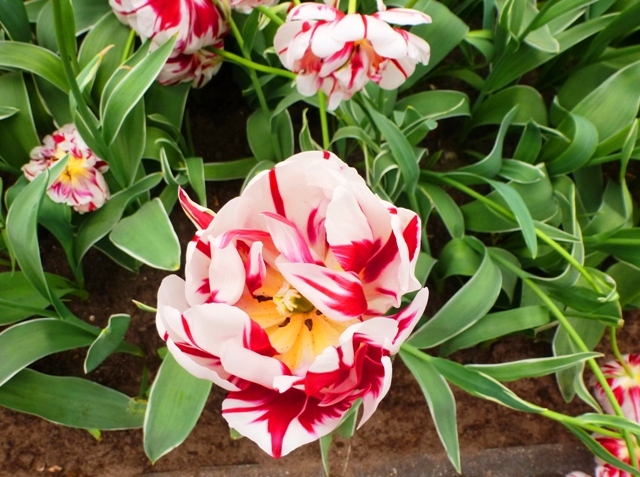 More photos from my visit to Keukenhof Gardens here. 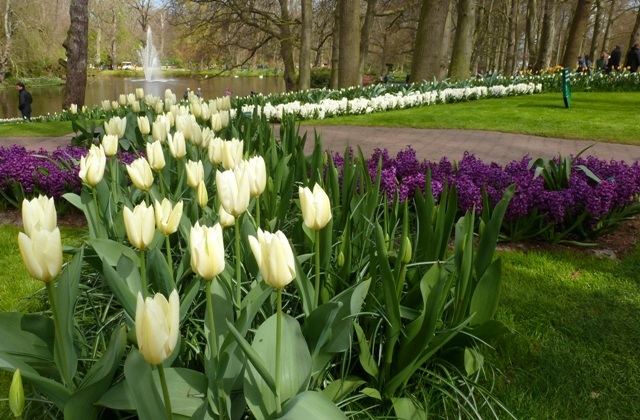 Open from mid March until May, find out more about the Keukenhof Gardens here. I travelled to Holland on the Stena Line ferry from Harwich and stayed in Amsterdam at the uber-cool Keukenhof Gardens here. I can highly recommend the Pocket Rough Guide to Amsterdam by Martin Dunford. 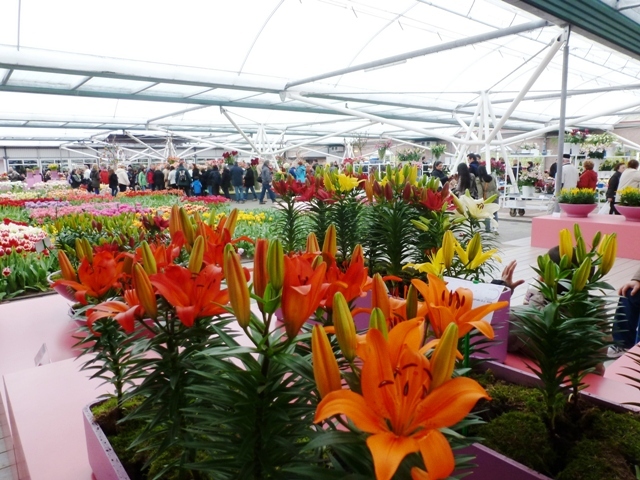 Thanks to Keukenhof Gardens here for organising the coach trip with Keukenhof Gardens here. A photographer’s dream indeed. Looks lovely Zoe and love all the quirky little touches throughout. 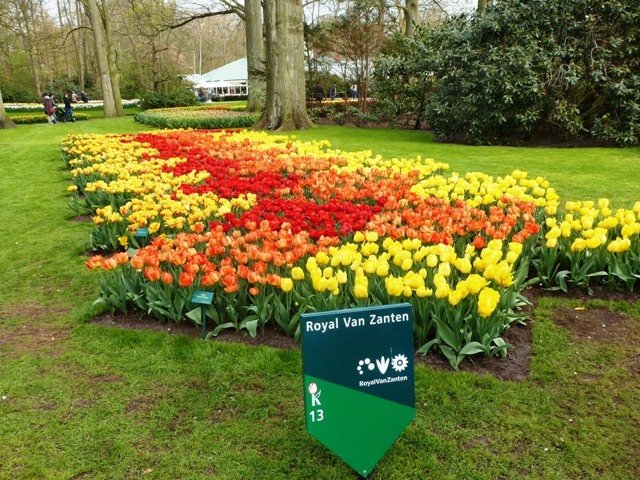 One of these days I’ll be marveling over the beautiful flower show that takes over Amsterdam every spring! Your pictures are stunning. Thanks for getting me even more excited about my upcoming visit. Can’t wait. I have never visited the Keukenhof Gardens but I will for sure soon now. WoW wonderful photos.